During peak times and seasons, it is easy to simply toss an additional register in another area of the store to open more checkout points. This would be a classic example of how placement can negatively affect you, despite good intentions. This solution adds to customer confusion and isolates them to small areas of the store, lessening the amount of customer-merchandise touch points. Ask yourself if your cash register placement is allowing a large percentage of your product to be seen during peak traffic flow. Optimize customer's idle time standing in line by drawing their attention to store signage and announcements. Information the customer needs to know can be placed as they approach the cash counter — information sheets, coupons, newsletters in a convenient display, or notices of upcoming events on dry erase boards. Both can distract the customer from thinking about the wait in line. The only thing that should be placed on a cash wrap countertop is the purchase and pocketbook. Leave out distracting merchandise and messages. Leave ample space for a quick transaction where the customer can efficiently sign their receipt, write a check, or accept change. By the time the customer reaches the cash wrap, their purchasing decisions have already been made. Instead of stocking the area directly behind the cash register with additional merchandise, use it to enhance the customer service experience. This space can be used to package purchases and gift-wrap during the holiday season. If you keep the customer in mind and aim to provide the most efficient buying process available, those customers will keep coming back and become positive advocates for your brand. Palmer Retail Solutions strives to offer our clients the absolute best combination of innovation, quality, service, and value for our diversified custom store fixtures and merchandising displays. 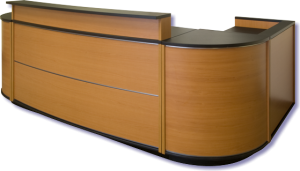 For more information about our designs, retail fixtures, cash wraps, kiosks, or point of purchase displays, visit our website at http://www.palmerretailsolutions.com.